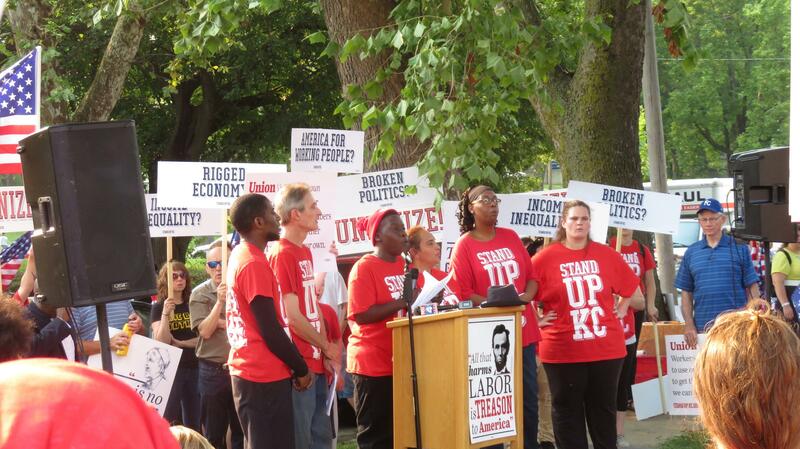 Leaders of Stand Up KC/Fight for $15 address a crowd gathered at 33rd and Southwest Trafficway on Labor Day morning. The rally, organized by Stand Up KC/Fight for 15, also attracted members of the Missouri General Assembly and U.S. Rep. Emanuel Cleaver. 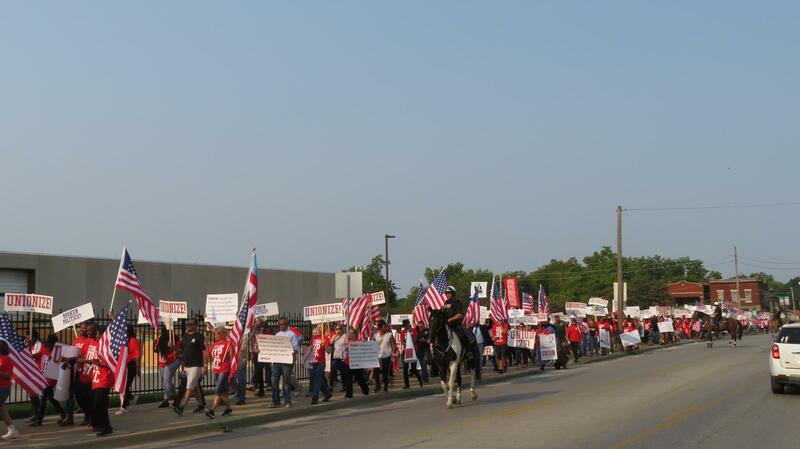 Labor Day marchers headed toward Linwood and Main in Midtown Kansas City. "Everybody needs somebody in their corner," Cleaver told the crowd. "One of the reasons the elected officials are here, they want you to know they're in your corner." Carrying American flags and signs, the members of the crowd then prepared to march toward Linwood and Main. As soon as they hit the street, they were immediately met by a half-dozen Kansas City police officers on horses, and several others on motorcycles and in squad cars, who blocked the street, telling marchers to stay on the sidewalk. With those boundaries established, the march proceeded peacefully. Demonstrators stopped and chanted for a several minutes in front of McDonald's on Main, then marched south to the Burger King near Armour Boulevard. 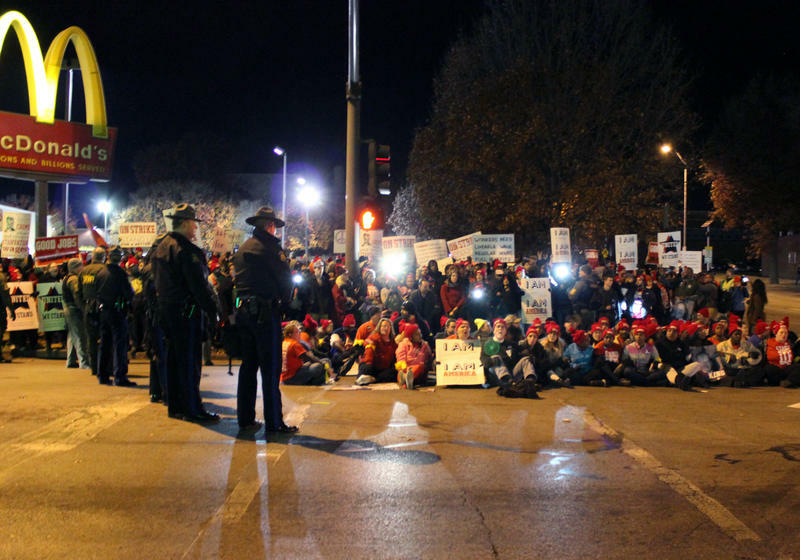 By the time the marchers returned to the grassy lawn at 33rd and Southwest Trafficway, any tensions between police and demonstrators had eased. A couple hours later, many of the demonstrators re-assembled in front of Research Medical Center, where members of the Service Employees International Union are currently in contract negotiations. The mood was festive as music played while the crowded waited for speakers to begin. When speeches began, their tone was serious. Richard Eiker talked about his "dream" of being able to retire, go to New York City and see a show on Broadway — a dream he called "out of reach." "After more than 25 years working at McDonald's, I still do not make enough to care for all my needs. It is a constant struggle to survive, to keep a roof over my head and pay for my medical expenses as I get older," he said. "I can barely scrape enough money together for gas and groceries, much less set aside savings for retirement." Research Medical Center employee and Service Employees International Union member Dot Morgan (with microphone) gives a speech at the Labor Day rally. To her left is Richard Eiker, who also spoke. Millions of Americans like him are living paycheck-to-paycheck, Eiker said. "Low-wage jobs, like hospital jobs and fast food, are the fastest growing in our economy," he said. "We are the ones who keep this country running, preparing and serving food, caring for the sick and the elderly and keeping the buildings orderly, clean and safe. We deserve better. We deserve retirement and health care. We deserve fair pay," he said. 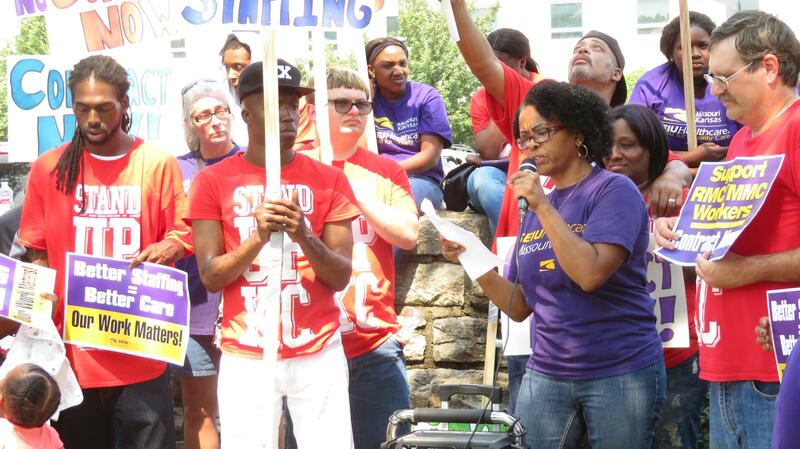 Eiker said demonstrations like those on Monday were the "true meaning of Labor Day," reminding the crowd that Labor Day became a holiday after workers took to the streets to call for better wages, working conditions and unions. Following Eiker was Dot Morgan, a unit secretary at Research. 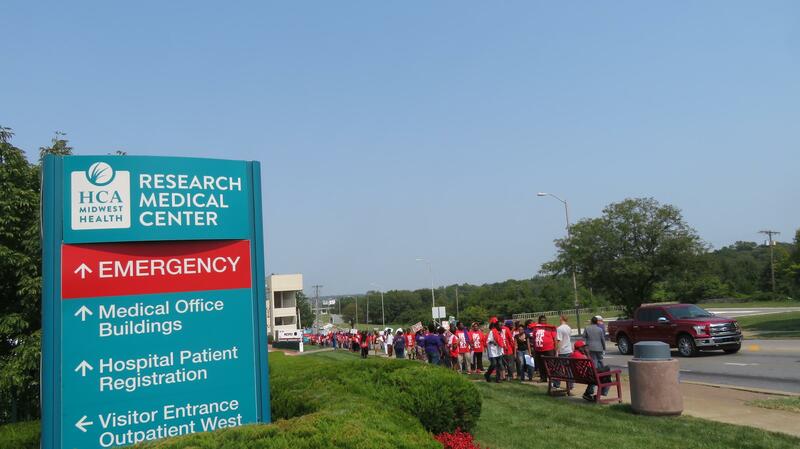 Members of Stand Up KC, the Service Employees International Union and their supporters picketed Research Medical Center on Labor Day. "I've worked here for 29 years," Morgan said. 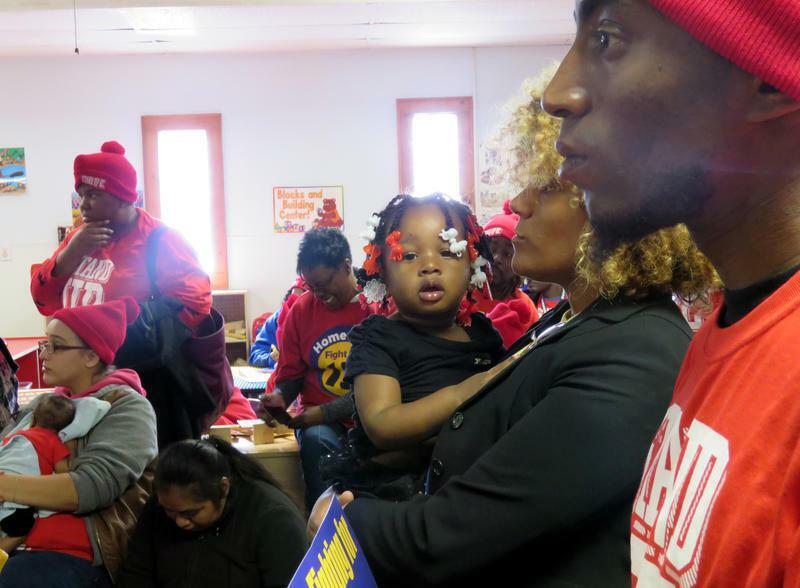 "Either I’m crazy or I like my job – I think I like my job," said Morgan, who is also an SIEU shop steward and member of the bargaining team. "Every worker in this nation, be it here, be it there — laborers deserve the right to have a voice on the job," Morgan continued. "No matter what industry you’re in or what you’re doing for a living, whether it’s in the food industry or the health industry. We the people are out here working hard every day and it’s important to get respect and be treated fairly." Morgan then called for a picket to begin, and the crowd marched again.